In an article published on Medium, “Universal Basic Income Is Silicon Vallaey’s latest Scam”, Douglas Rushkoff maintains that “The plan is no gift to the masses, but a tool for our further enslavement”. 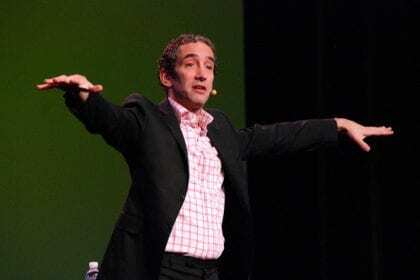 Rushkoff was once a supporter of universal basic income (UBI), he says, but during a talk at Uber’s headquarters, with Uber management itself bringing up the possbility of UBI, an epiphany occurred to him and he changed his mind. “The real purpose of digital capitalism is to extract value from the economy and deliver it to those at the top”, he says, and digital companies act by enacting a revised, perfected version of primitive accumulation. At this excels Amazon, by being an “automated wealth extraction platform”, through the control of the retail market and partially on the production of goods. But it becomes a problem when all the value is extracted from the market, consumers become too poor to pay for services or can’t buy enough goods, and even their data loses value. Silicon Valley’s support of UBI would, in Rushkoff’s view, be motived by a will to keep people from considering more enabling possibilities, which could challange the status quo: rather than asking for an allowance, we should ask for an ownership stake, as inequality rests on uneven distribution of assets. Assets that have been successfully appropriated by big corporations, which, unable to put money back in the economy, now ask for government intervention. Rushkoff’s solution is, rather than UBI, a form of universal ownership: Universal Basic Assets. To support his view, he mentions the case of Denmark, where people have access to a share of the nation’s resources and consequently the social elevator works properly. This lends itself closer to the Commons concept, an ancient form of organizing societies but which has almost completely disappeared from today’s globalized and digitized society. Article reviewed by Dawn Howard. Daniele Fabbri has written 17 articles. Since “free democracies” had stopped creating their own currency, people are losing $trillions per year in the form of interest, debt/dispossession, and loss of ownership to private banks. Giving bureaucrats first dibs on newly created currency is as bad as banks. Do we permit this robbery to continue, or return the money to the people? I thought that UBI is indeed a dividend, or can be considered a dividend based on each citizen or resident having an equal share in the government, in the sovereignty over the country’s assets., whose “profits” come from taxation. The objection in this article reduced simply to the question of how this dividend should be funded and how the amount should be determined. Ideally, the amount should be based on the poverty level, and the tax to fund it, the government’s “profits” adjusted accordingly. Why can’t UBI be considered a dividend, based on a share of ownership in the country’s shared assets? —or, at least, it could, if there was goodwill among all parties. Which, there is not. No. Communism is, by definition, a revolutionary movement to create a classless, moneyless, and stateless social order built upon shared ownership of production. With Socialism, the core principle is the nationalization of the means of production – i.e. the government seizes Amazon and Google. UBI is none of those things and actually fits so seamlessly into capitalism, it is projected to grow the economy $2.5 trillion in eight years. Really, UBI is necessary for the continuation of capitalism through the automation wave and displacement of workers. Markets need consumers to sell things to. Universal Basic Income is capitalism with a floor that people cannot fall beneath. Michele, Kenneth was accusing Rushkoff of wanting Communism in the way that Rushkoff is *rejecting* UBI. You replied with a defense of UBI. As far as we know, Kenneth is a UBI-proponent who dislikes Rushkoff’s UBA preference.